For goodness' sake, it's Jim Eastlake! Jim - it's just terrific to be working with you at HfS! Can you share a little about your background and why you have chosen research and strategy as your career path? Hi Phil. I think that I can sum that up in one phrase….. 'The Big Picture'. I began my career at Texas Instruments in 1981. It was a good place to learn the semiconductor business, but TI was very introverted in those days. So, after 6-7 years I decided to join Dataquest, THE preeminent chip research firm. It would only be for a couple of years, then I’d join another semis company. Little did I know that I would become hooked. I loved the opportunity to talk to senior management and strategists from across the industry (Gordon Moore, Charlie Sporck and Jerry Sanders amongst them), focus on the big issues…… and try to figure out what was going on. I’d then formulate my thoughts in research reports that I hoped would educate and inform, and, amazingly, I got good feedback. The world has changed just a bit since then! We now stand on the cusp of the next industrial age, Industry 4.0 and all that. It is the Professional Services firms that are performing THE vital task of stitching hardware, software and services together. They enable a myriad of “digitalization” projects that deliver huge benefits to society. So, what better place to continue my lifelong exploration of the big picture than at HfS. Where is the industry right now, Jim? Are things really that different than five years ago when you started covering IoT? We’re following a classic saturation curve Phil, and it’s very early days. Things change fast. The industry takes big strides forward all the time. In the past five years, much has changed: platform architectures, security, edge computing, contact T&C’s, formation of industry standards - just everything. What are the top obstacles to IoT adoption, and how can Service Providers help overcome them? What IoT platforms are winning out, and why? And, is there a trend to using “standard” platforms as opposed to a Service Providers’ proprietary offering? What reasoning lies behind the Edge vs Cloud computing decision in a project? Why do customers choose different Providers for different projects? What comprises a true end-to-end IoT solution? What proven business benefits of IoT are emerging in each of the industry Verticals? And finally, is the analyst industry as exciting as it was 10 years' ago? Immeasurably more so, I’d say. Simply because of Digitalization. Change has always represented an exciting time for the industry observers, there’s not been a time like this during my, nearly 40-year, career in the industry. Everything from semiconductors to Services is involved in enabling change that is Societal in scale. Also, on a practical matter, it is now so easy to communicate with clients and to get research to them. Social media, chat rooms, Webex, Skype and the likes provide us with a much more effective communications conduit. Jim - it's terrific to have you join us and can't wait to hear about the convergence of OT and IT! Who said change management was critical? Isn't it amazing how history has this habit of repeating itself? Especially when it comes to services engagements, where the buyer hopes to shed loads of cost and the providers hope to make a handsome profit, while building a utility model to resell similar engagements to many other buyers. And that is what we're seeing, as the services industry evolves from engagements deriving value from lower wage costs to one which combines lower wages with the RPA arbitrage of repetitive tasks being computerized in software recording devices. As one analyst firm once famously declared exactly five years ago: "Welcome to Robotistan, Outsourcing's Cheapest New Destination". Or is it? The difference these days, is that many of the emerging services engagements are being based more on hope than certainty, where many buyers (often naively) think this is going to be just as easy as lumping the work offshore, and many providers simply have little choice but to sell them the dream, and live through the hell with them, if they want to stay relevant in this market. How else can you build an effective automation-led services model, if you don't have the guinea pig clients to join you on that nice packaged holiday to Robotistan... And, let's face it, how else are both buyers and providers supposed to behave, when there are so few historical benchmarks to set baseline metrics that both parties know are achievable? Yes people, welcome to the era of Shock and Awe automation deals... it's the only way. The issues that are starting to unravel in this robotic age, is the simple fact that most clients avoided the painful transformation to their data processes and people, during their earlier efforts to source work to lower cost global locations. They were pretty much able to delight their CFOs with 30%+ savings, without having to do much to change their underlying process architectures (the old "lift, shift then transform" approach usually stopped after the "shift"). The reality of moving into an automation arbitrage environment is that you can't just replicate that work into an even cheaper robotic environment without really figuring out how to do this effectively. Bot licenses are not cheap, and simply do not make financial sense for a lot of processes, the way they are currently being operated. You can simply end up paying $8K a year for a bot that only is utilized for 20 minutes a day, when you could streamline that process into a broader workflow and use that same bot to process a lot more work for the same cost. Looking at several engagements already in place, clients are committing to significant staff reduction within 12-24 month of contract signing, and many are quickly realizing they are facing some serious complications if they are going to meet the metrics their CFOs are expecting. Either they end up running operations on desperately thin staff numbers, or they own up that they need to rethink that they need a significant transformation on their data infrastructures, processes and people culture, if they are going to enjoy the delightful fruits of Robotistan. As several early RPA adopters will already tell you: You need to do MDM before you RPA. When you talk to some of the leading consultancies in this space, they will tell you that they are making more of their revenues on pre-implementation transformation work, just getting clients into a place where they can do this. They will also tell you the issues are not about the technology, but much more about the change management necessary to deploy the technology effectively. The biggest issue facing the services industry today is that we have run out of silver bullets, BandAids and scapegoats. In order to get to Robotistan, you need to finally look deeply into your underbelly of messy processes, spaghetti code, manual workarounds and other funky ways of handling exceptions. Moreover, you need to look at your people and figure out how to foster a culture of inclusion and innovation. Most enterprises have been stagnating for years, but as the guinea pigs find their way through their shock and awe of having to conduct real surgery - and psychotherapy - on themselves, a new rulebook that guides us through the steps we have to take to learn, think, calculate and act, will emerge that many of the laggards will gleefully follow. 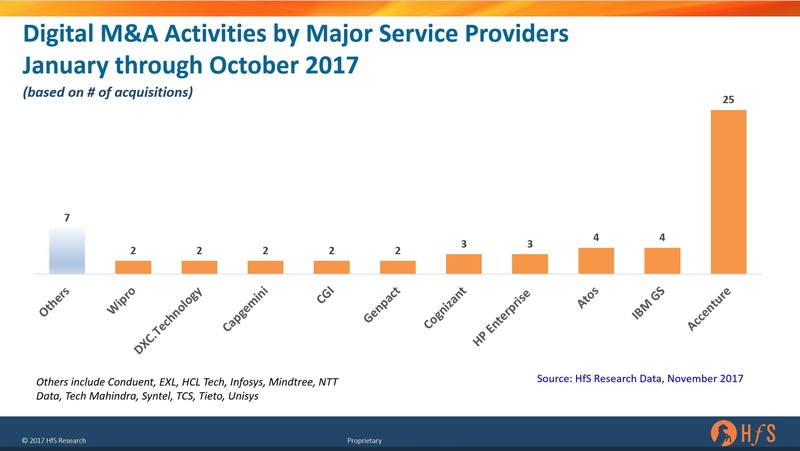 Phil Fersht, CEO and Chief Analyst, HfS Research: Good morning Mike - it's been a couple of years since we first discussed the big digital push your firm is making. Can you share an overview of how the market has evolved since then? We seem to have suddenly shifted from the doom and gloom of robots taking our jobs to people proclaiming that AI is going to create millions of new jobs. And if you haven't endured this latest round of hype, I envy your unique skill in removing fake news from your life. Suddenly AI is the antidote to automation! Really? Don’t we have a responsibility to inject some reality into this conversation? Today’s business world is about removing physical touchpoints, about fixing our data, about running processes faster, smarter, more autonomously, and cheaper… So where are the real links between the universities, the politicians, and the businesses? Why aren’t we really debating this stuff in the senates and parliaments if today's organizations are on an inexorable drive to sub people for better data? Instead, we have academics and "analysts", desperate for attention, making unsubstantiated predictions that are only fuelling the tech firms, desperate to sell their wares without this negative connotation that the real ROI of selling their products is tied to labor elimination. Let's just make the call - AI is indirectly and inextricably tied to the elimination of "unnecessary" labor, by nurturing systems that get smarter with each incident and transaction. The smarter and more autonomous your operations become, the more agile and efficient your business becomes. That's not a terrible thing - in fact, you are doing your valued staff a huge favor by keeping them employed and keeping them relevant to your business. But you are not creating a net influx of jobs into your organization, you are becoming more fluid and competitive. Sure, you'll probably look to add some Python and R developers, Machine Learning experts, serious data geeks and design thinkers - or you may just pay consultants to do it all for you - but the bottom-line, here, is that you're going to be shedding a lot of your left-brained staff performing jobs that can be artificially automated, at a much faster rate than you'll be adding the data-oriented people you need to digitize your business. AI is about doing more with less, not more with even more - let's get real. Don't get me wrong, the possibilities of faster, smarter, touchless data flows between the customer and the operations of the business, are critical to promote competitiveness and survival, but let's stop sugar-coating the true purpose of data driven intelligence - the less businesses need to rely on people and the more autonomously they can run processes, the more nimble and profitable they will become. Now if these businesses then choose to reinvest their new-found wealth hiring loads more people, I will tip my hat to these purveyors of job hope, but let's fact facts, the companies of the future will be running a lot of smart technology with a smaller group of savvy people to manage it all. 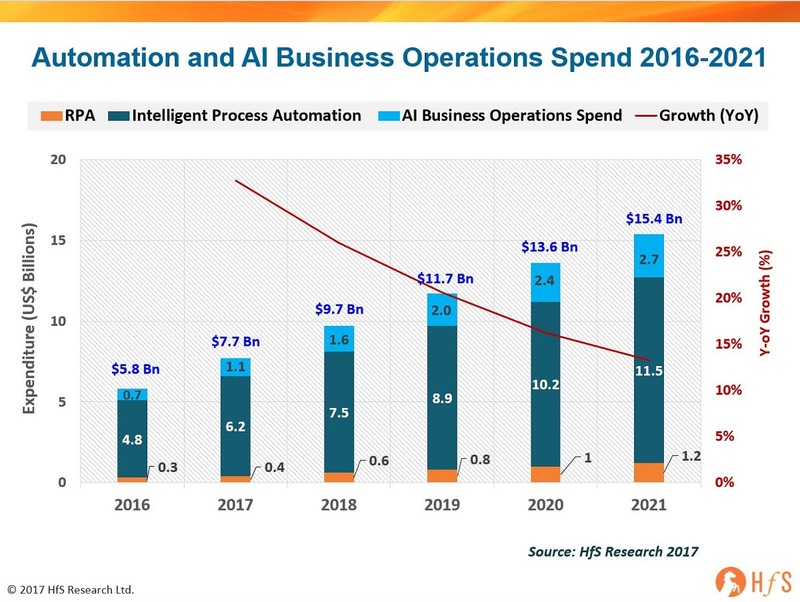 While there’s a lot of noise and scaremongering in the public sphere around job losses, the real story is that automation technologies of various flavors and deployments — RPA, RDA, AI, etc. – are quietly creating a new execution layer on top of the IT “stack,” one that offers a flexible, reconfigurable operations platform for the business. Freed from the costs and rigidity of legacy systems, savvy enterprise architects see automation technologies, together with the data they capture and generate, as a way to digitally connect their back-, middle-, and front-offices for greater throughput, quality, and responsiveness. 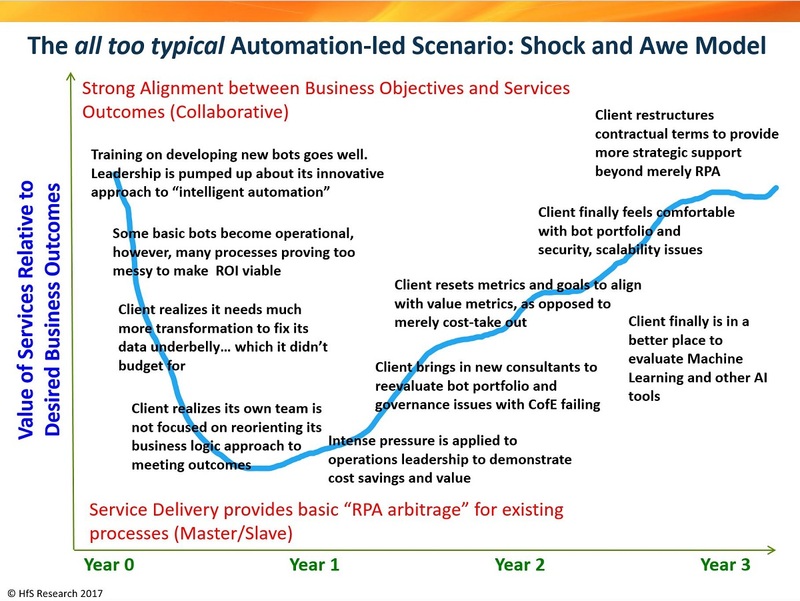 Automation is destroying the traditional FTE-based cost/value equation for service delivery, and we need a new “post-FTE” commercial model, one based on partnership, business outcomes and joint value creation for buyers, advisors, and provides. The economic value of a robot is vastly different in kind, cost and scale from that of a human being, and is forcing us to rethink the value of different kinds of work – separating rote transaction work from judgment-based work. Ultimately, this will require all parties to re-think their offerings and value propositions and to demonstrate imagination, creativity and flexibility, while educating their respective stakeholder communities and managing the financial and human impacts. 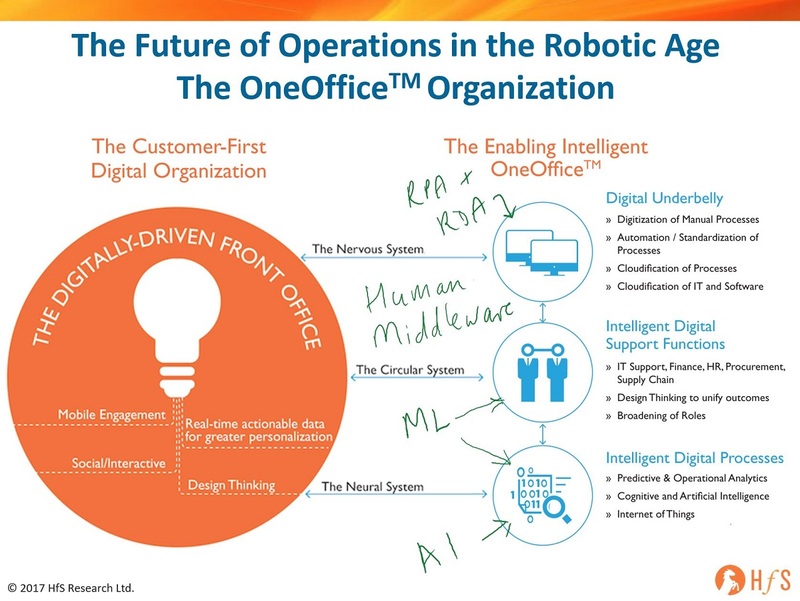 Success in achieving the OneOffice future requires a blend of strategy, business design, and technology skills to re-think and re-configure core processes with a singular focus on improving the customer experience v. just cutting costs. Automation per se looks deceptively simple (and is often sold with that promise) but can fail to deliver true value if simply retrofitted on existing processes; coupled with artificial intelligence and cognitive, automation can support new services and capabilities at speed and scale. But thoughtful tool selection and disciplined deployment is crucial. And as data grows exponentially, it becomes the essential raw material for every enterprise in every industry. At every level of the organization – from the C-Suite to manager – enterprises need people who appreciate and understand the value of data and who can identify/extract the most important customer-relevant insights. Native digital businesses have demonstrated the value and power of a digital operations approach by thinking about their business from a logical rather than physical perspective – focusing on customer outcomes rather than internal inputs. They begin with an intense focus on identifying their customers’ most important ‘priorities’ (as distinct from ‘needs’) to design a differentiated and dynamic customer experience. They then build and optimize a collaborative partner ecosystem to deliver that experience, leveraging specialist capabilities and resources. The result is a more disaggregated but fiercely cooperative business model. The challenge for non-digital natives is to re-imagine their businesses from this logical perspective and to demonstrate what one executive called the “willingness to let go.” That implies – and requires – a fundamental re-thinking around control and governance as well as motivation and reward, supported by deep and enduring commitment to change management.